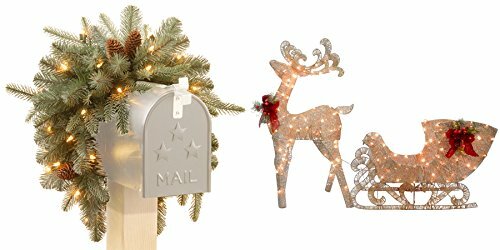 Deck your mailbox in festive holiday swag. This 3-foot Arctic Spruce features frosted pine tips and festive pine cones illuminated by the warm glow of 35 soft lights. This Santa's sleigh with reindeer is made with acrylic material that is strong and durable to provide many years of enjoyment. It is lit with 70 warm white low voltage LED lights that make this holiday display sparkle. Both reindeer and sleigh feature a decorative red bow. This seasonal trimming can be displayed in indoor or outdoor locations. If you have any questions about this product by The National Tree Company, contact us by completing and submitting the form below. If you are looking for a specif part number, please include it with your message.